We can transfer digitally 16 and 20 bit Alesis ADAT 8 track tapes or sessions with higher track counts spanning multiple tapes. 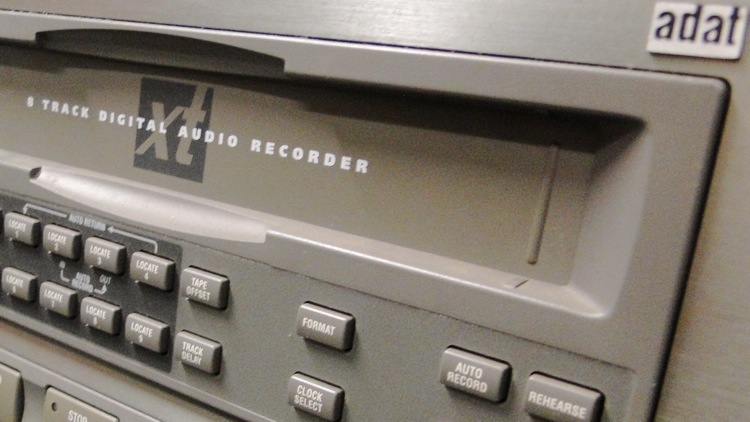 Like DTRS recorders, ADAT tape recorders use a video tape transport but running at a faster speed. Unfortunately most ADAT machines used a consumer tape transport that was not particularly rugged, often causing tape lacing problems which will damage tape. Only the later M20 and Studer ADAT machines used a much higher quality transport that lasts well. The ADAT format was based on a VHS transport but even so spares will not be available for ever and key spares like the upper and lower head drum, while generally long lasting will wear and need replacement. Alesis Digital Audio Tape or ADAT is a magnetic tape format used for the simultaneous digital recording of eight analog audio or digital audio tracks at once, onto a Super VHS tape used in consumer VCRs. The first ADAT machine was released in 1991 and had a major impact on the recording industry, and home recording. Like the DA models released by TASCAM, a major benefit was that they could be synchronised with other machines, allowing for people to build their recording capacity 8 tracks at a time. ADAT’s use of ½ inch S-VHS video tape meant that the larger tape width was less susceptible to damage than the 8mm Hi-8 tapes used by the DA-88 and DTRS. The S-VHS tapes could record 40 minutes and because 8 tracks of audio require a large amount of bandwidth, the tape moved up to three times the speed of the average VHS tape. ADAT is still used in some industries and the recording industry, even if it has to a large extent been replaced by Digital Audio Workstations (DAWs). Tapes are still available from some retailers. ADAT now refers to the Alesis ADAT HD24-XR, which features hard disk recording rather than the traditional tape-based ADAT, now considered obsolete.